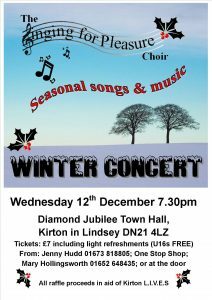 This popular Waddingham-based choir have made the Town Hall their performance base and return with songs & music to mark the season. They will bring their usual wide-ranging repertoire and eclectic mix of music, songs and readings. Always a good night. Tickets: £7 including light refreshments (U16s FREE) from: Jenny Hudd 01673 818805; One Stop Shop; Mary Hollingsworth 01652 648435; or at the door. Follow on Facebook to see all activities. Error: Error validating access token: Session has expired on Saturday, 23-Mar-19 02:32:21 PDT. The current time is Thursday, 25-Apr-19 22:49:09 PDT.